Environmental protection campaigns, especially garbage collection, have been launched across the country. The message about environmental protection is also spreading and growing day-by-day. 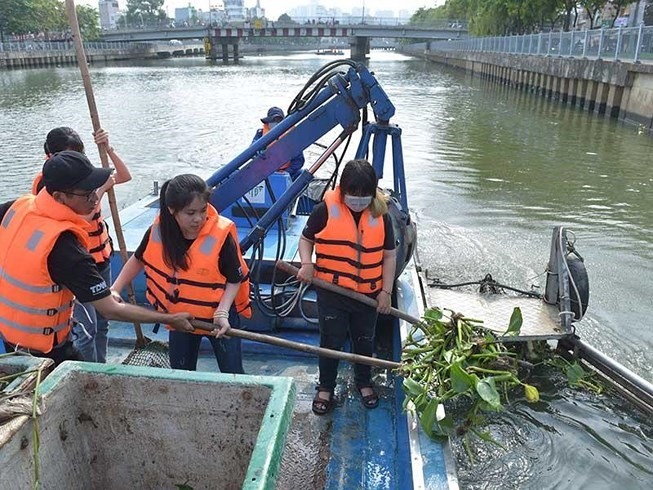 The story about nearly 100 young people collecting garbage from a canal in District 2, HCM City, has attracted comments on social networks because the local People’s Committee is trying to shut down the operation. On March 17, Vũ Ngọc Chiến, a swimmer who had the idea of collecting trash using paddleboards, launched a garbage collection campaign along a number of canals in Thảo Điền Ward with nearly other 100 young people, Thanh Niên (Young People) newspaper reported. “My group planned to use paddleboards to collect waste along the canals but we did not inform local authorities so we were forced to stop,” Chiến told the newspaper. Chiến’s group had previously asked for permission from the management board of the Nhiêu Lộc – Thị Nghè canal to collect trash, but they were told to consult with the local People’s Committee. "I was so tired of submitting all the applications, so we started a group of 20 people collecting trash from the roof of Thủ Thiêm Tunnel,” Chiến said. “We planned to work every month in order to make people pay more attention to environmental protection. We don’t know which agencies we should apply to for permission next time,” Chiến said. Huỳnh Thanh Khiết, deputy chairman of the People’s Committee of District 2, explained that the district fully supported voluntary activities on environmental protection but the group should report their activities to local authorities in order to ensure security and order, and most importantly, safety. A leader of Thảo Điền Ward’s People’s Committee also said he supported the idea. “Tight administrative procedures are causing difficulties for this group who want to contribute their time to cleaning up the environment, said Nguyễn Việt Hùng, a resident from Hà Nội’s Hoàng Mai District. In 2016, the leader of Yên Hòa Ward in Hà Nội’s Cầu Giấy District complained about a foreigner who had collected garbage in the ward without permission, causing public outcry, Hùng said. Local governments should find solutions to prevent littering instead of obstructing voluntary garbage collectors, Hùng said. But there are also many supporters of the government’s stance, and I’m one of them. “The spirit of environmental protection is always supported by the community but safety needs to come first,” said Phan Quỳnh Liên, an officer from the Hồ Chí Minh Communist Youth Union Central Committee in Hà Nội. In order to collect garbage from canals, ponds and lakes safely, people need to contact local authorities for advice and support, Liên said. “They should also contact local youth unions for support,” Liên said. Given the fact that Chiến’s team was unable to get permission from local authorities, I think we need regulations in place for people who are simply trying to lend a hand.